First you have to learn what does number and letter on the etiquet of our bra mean - disclaimer,some bra makers use S(small), L(large) , (XL) extra large... markings also ,but those are easier to grasp,right? How do we figure out the bra size that we need and what all that just simply means? Measure yourself! Measure the obim of your cheasts first - start from the bottom (just benith your breasts) of your chest and go around your back. 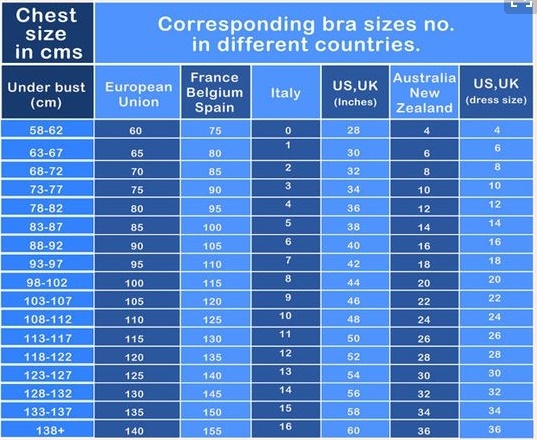 So if you are 68-72 cm wide in chest area you can find your bra size in bra size chart wich can differ from continent to continent ,so if you are online shoping find a bra size chart online for the country you are buying from ! But for example lets take European size chart in wich with our hypotethical cm (68-72) we previously measured your Cheast size would correspond with bra size number 70! The number you get,also know as the breast size minus the number of your cheast size equals the number of your cup!